<< Back Lozenge Pony Butterfly Pelham 10mm 4.75"
Lozenge Pony Butterfly Pelham 10mm 4.75"
needed. Helps with outline, turning and lightens the forehand. The butterfly cheeks are excellent for directional control; straightness and turning, hence beneficial for show jumping etc. Highly recommended for children who do not always support their inside rein as the mouthpiece will not slide across to the inside. Popular in the show ring employing two reins or split reins. In other circumstances Pelham Roundings may be used offering a one rein option. 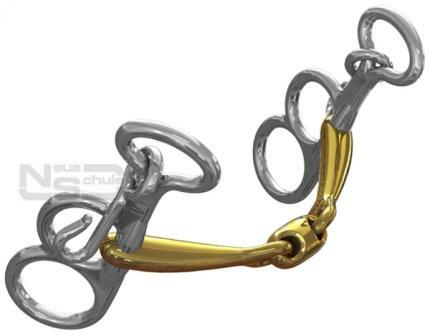 May be used with the traditional metal curb chain (supplied) or alternatively the neat Neue Schule Pony Leather Curb Strap is an optional extra.